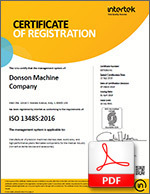 Donson is ISO 13485:2016 Registered. Our goal is to exceed the expectations of our customers by continuous improvements in our quality system. As a certified supplier to our major customers, we provide pre-inspected, “dock to the line” parts, eliminating redundant receiving inspection. 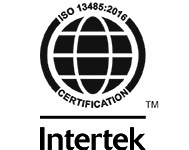 Process integrity and consistency are evident throughout our manufacturing and quality management systems. Many of our customers consider Donson the benchmark for excellence in machining. We continually invest in the latest equipment. Donson trains and recruits some of most talented, experienced machinists in the Midwest. Their knowledge and attention to detail is the most critical factor in Donson quality. Every new Donson employee is taught that quality must be the number one concern at all times. Our culture demands personal ownership of quality, continuous improvement and innovative problem solving. Donson has over $1 million invested in inspection gages and equipment. 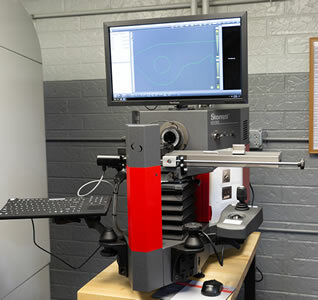 In most cases we perform on-site calibration in our newly-expanded, environmentally controlled metrology department. 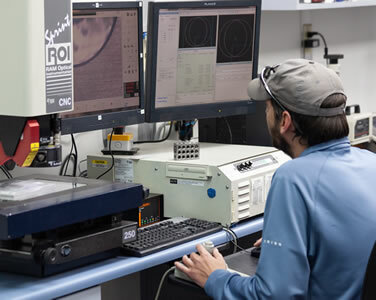 We utilize RAM Optical Sprint Vision inspection systems including both contact and non-contact measurement and automated measurement routines using eBx metrology software. 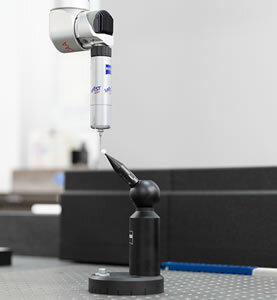 For CMM measurement, we also utilize the Zeiss Accura II CMM with Calypso software as well as a Brown & Sharpe DCC 454 CMM with latest generation PC-DMIS software. These versatile tools allows us to use customer CAD models to generate inspection routines and to create detailed, highly accurate part documentation. Our operators and quality inspectors perform in-process inspection and audits to ensure consistent, high quality. Both in prototyping and production runs, we regularly utilize SPC and special testing to ensure the quality of your product.